I was born and bred in Northern Rivers NSW, the home of my ocean passion, and the land of some of the most incredible beaches in Australia. It’s funny though isn’t it, the process of going to the beach, especially here in Australia, the ritualism and sentimentality, a place of its own rules. You grab your towel, sunnies, thongs and sunscreen, step onto the sand and breath in the air, you feel at home; the prospect of cold, salty water on your face is almost too much to bear. You scope out the beach, to the left a group of ocean swimmers taking the rip up the side out to the back for a peaceful swim, the kids kicking up sand and digging holes for their fortresses, the surf lifesavers manning the beach providing us with protection, and finally there they are, the surfers. The concept of surfing was always interesting, but I always threw it into the too hard basket, as though I would never be able to do that, or if I did I would look ridiculous trying. Today the Swim Sisters overcame some of our fears, we took the courage we have built from swimming, and today we learned how to surf!! To be honest I was excited but nervous, what if I can’t do this? What if people get annoyed at us? What if, what if what if? But once we arrived the beautiful staff at “Let’s Go Surfing” in North Bondi eased all of these worries. First, they showed us an overview of the beach, one were familiar with for swimming, but not so much for surfing. Surfing was just always there, you know the pocket on the beach where the swimmers weren’t allowed, and as someone who grew up near the beach their whole life, with a dad and brother who surfs, you would think I knew more about it. You know what they say; ignorance is bliss, so not the case for surfing, my ignorance had me missing this awesome life changing sport. We then headed down to the beach and grabbed our boards for some on beach training, boards on the ground with us lying on top, emulating the coolness of the surfer but lacking the reality of just how hard it really is. My inner voice was saying yes you can do this, my fears telling me I was too big to even get on a board, too uncoordinated to even catch a wave, those darn fears. We finally got in the water for a little laying down wave catching session, off we went, getting through the first bit of whitewash, paddling to the first set of small waves. Finally we reached the second sand bar with some ideal small waves, so turning around, with the wave 2 metres behind us my training rhetoric began, “paddle, paddle, paddle, wave touches the feet, paddle, two, three and chicken wing arms, presto”. These instructions may only make sense to a surfer, but they are elemental in learning whilst not drowning! The first few waves were a bit of a flop, but then something clicked, I got the timing my paddle to chicken wing arms weight shifting ratio had met its prime and I caught a wave all the way into the shore, and one after the other we all got the hang of it! Today we were especially grateful to have this experience with Lets Go Surfing because we got to try out Speedo’s amazing new modesty suits. I love Speedo, they are durable, practical and most of all understand that we have a job to do in the water. I have been hanging for a modesty range from Speedo for a really long time; they embrace women’s differences and understand that we all have different needs, not to mention they last a lifetime. Next, we would head back into land for the standing up bit; you know the bit where we get validated into the surfing hall of fame. So boards down on the beach, lying down, a couple of visual lessons and then a bit of on sand practice and out we went. I was repeating the instruction, feet on the tail, feet flexed, paddle, paddle, paddle, wave on feet, paddle, two, three, chicken wing arms, back foot up, front foot up, surfing. Easy right? Hmmm, not so much. But much to our surprise, a few practice runs, and a few of us were up, yes surfing wave’s baby. I think the most memorable moments were catching the big waves all on our own, just riding with the power of water behind you, cruising off into the sunset, or in our case a few small children and our sister surfers. By this time one of the local dads who was coaching his young son, had decided he would help push us off into the wave. It was at this moment I realised, in the water there is no judgement. The world of surfing lives within its own bounds and community, with its own rules that one must be inducted into with courage and optimism, never give up, no matter how hard, respect each other, no matter who you are. “It’s like the Mafia, once you’re in you’re in. There is no getting out”. 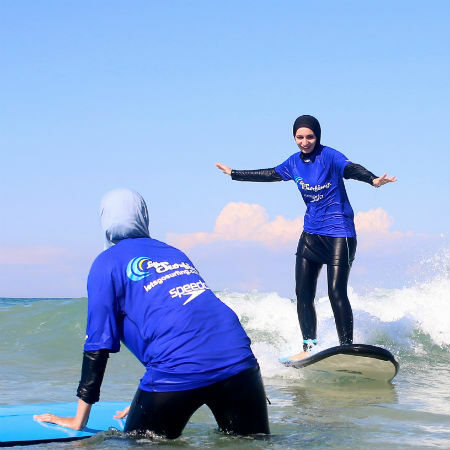 So look out world, here come the Surfing Sisters. Until next time, hang loose.